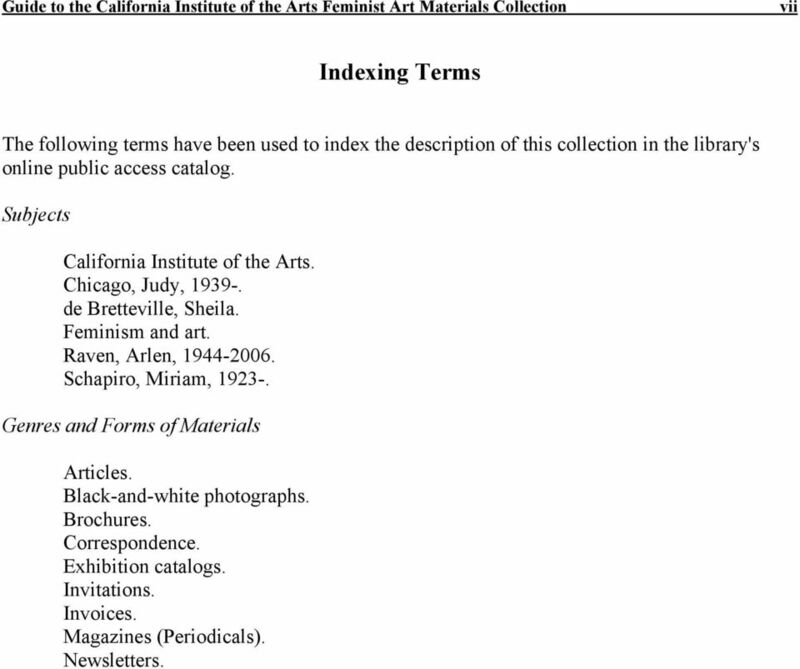 Download "Guide to the California Institute of the Arts Feminist Art Materials Collection 1971-2007 [bulk 1972-1977]"
4 ii Administrative Information Access This collection is open for research with permission from the manager of the California Institute of the Arts Archive. Publication Rights Property rights and literary rights reside with California Institute of the Arts. 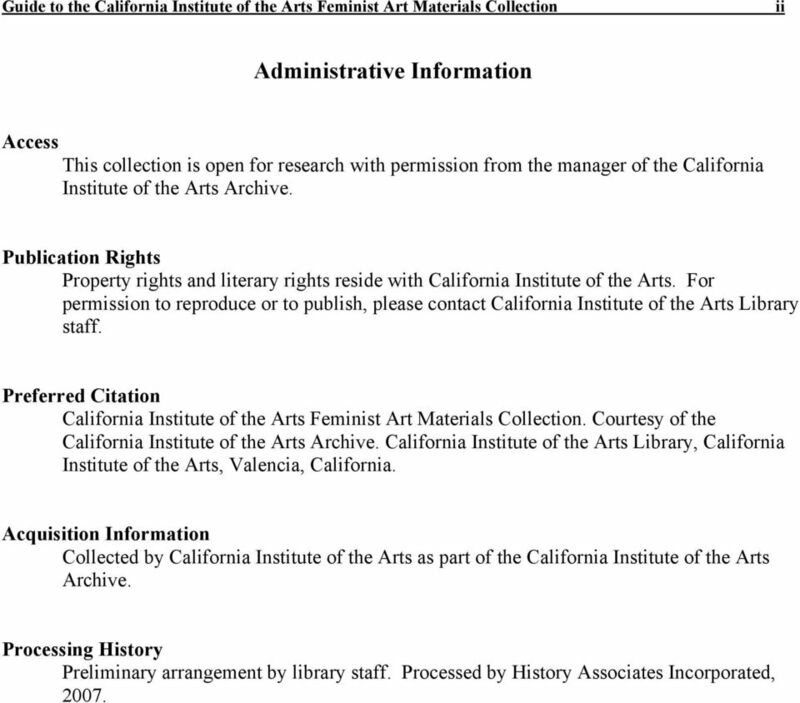 For permission to reproduce or to publish, please contact California Institute of the Arts Library staff. 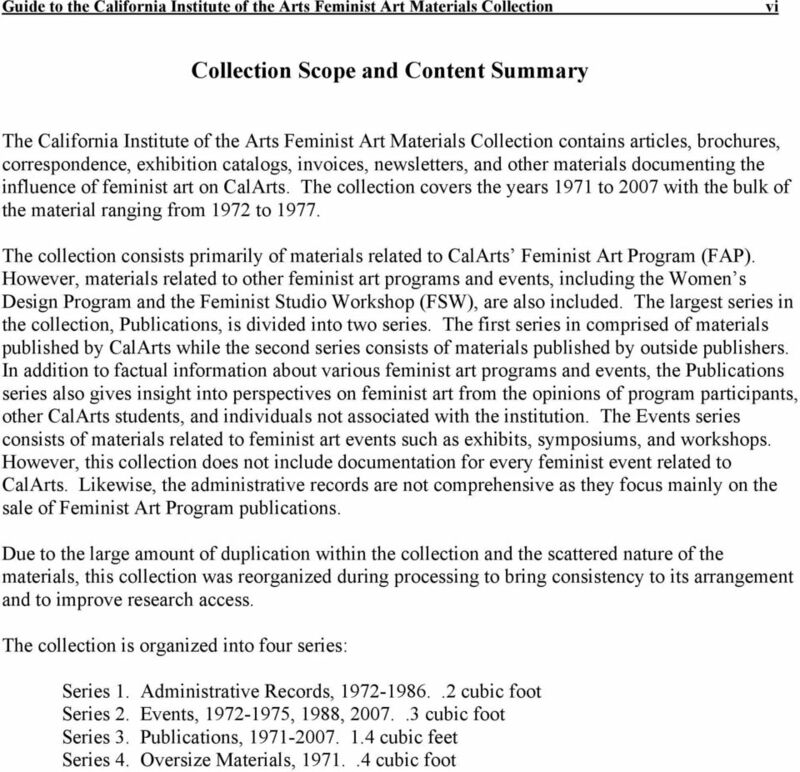 Preferred Citation California Institute of the Arts Feminist Art Materials Collection. Courtesy of the California Institute of the Arts Archive. California Institute of the Arts Library, California Institute of the Arts, Valencia, California. 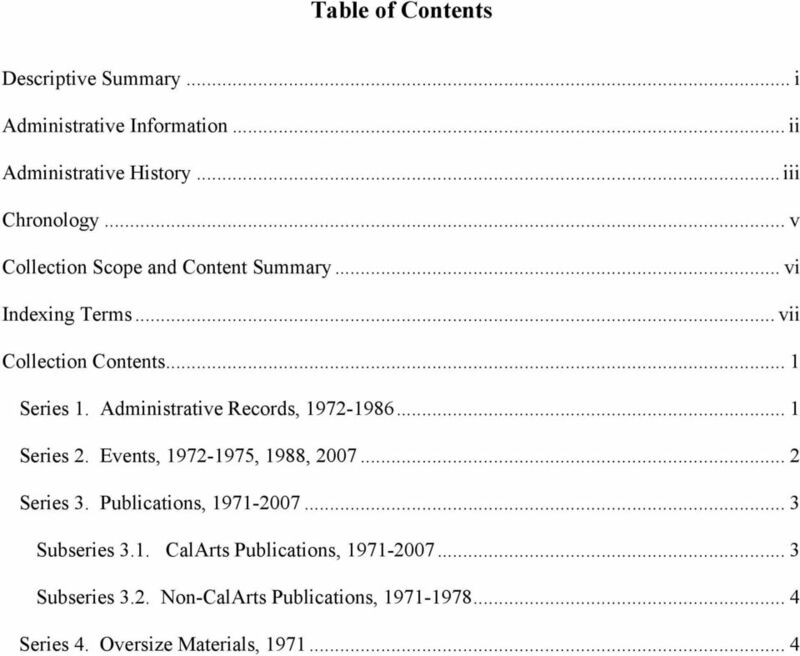 Acquisition Information Collected by California Institute of the Arts as part of the California Institute of the Arts Archive. Processing History Preliminary arrangement by library staff. Processed by History Associates Incorporated, 2007. 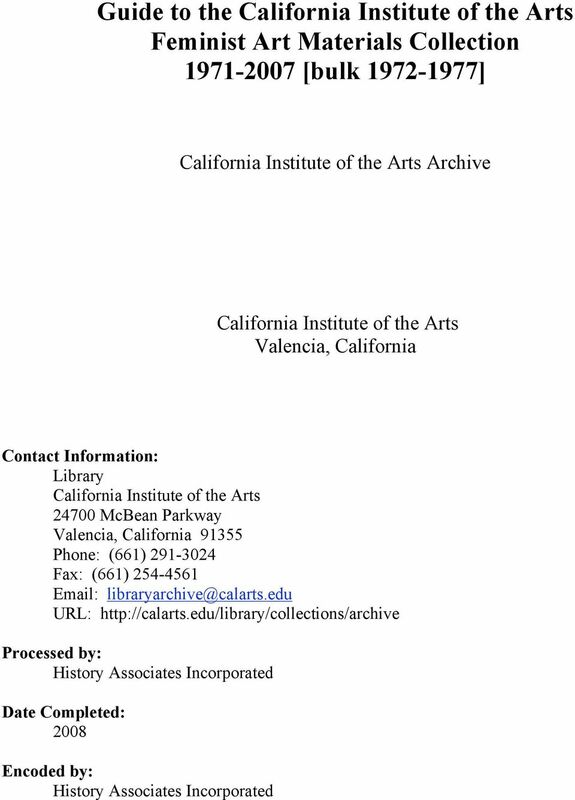 5 iii Administrative History California Institute of the Arts, commonly known as CalArts, is located in Valencia, California, and grants degrees in the visual and performing arts. Incorporated on September 1, 1961, it was the first degree-granting institution of higher learning in the United States created specifically for students of both the visual and the performing arts. It was the dream and vision of Walt Disney to create such an institute and he provided funding for it in his will. Initially formed through the merger of the Chouinard Art Institute (founded 1921) and the Los Angeles Conservatory of Music (founded 1883), it opened at its present campus in Valencia, California, in November In that same year, CalArts faculty members and noted artists Judy Chicago and Miriam Schapiro co-founded the Feminist Art Program (FAP). Based on the experimental program Chicago had started at Fresno State College the previous year, the FAP at CalArts was one of the first in the country to offer team taught courses on female art history taught exclusively by women for women only. Also founded in 1971 was the Women s Design Program, led by Sheila de Bretteville. Like the FAP, the Women s Design Program was a one-year program that focused on participation in various processes by which art is created, including group consciousness raising sessions, performance workshops, and reading of feminist literature. Approximately twenty-five young women artists joined the FAP during the program s opening year. Work on the program s first class project, Womanhouse, began on November 8, The purpose of Womanhouse was to provide a better understanding of women artists by themselves and by the predominately male art community. Together the artists transformed a deserted, seventeen-room, Los Angeles mansion into an exhibit space. Each artist chose a portion of the house in which she had complete freedom to explore aspects of female experience through her art. The completion of Womanhouse coincided with the West Coast Women Artists Conference, hosted by CalArts. Despite its name, the conference included participants from states all over the country. On the evening of Friday, January 21, 1972, the conference commenced with a tour of Womanhouse followed by performances presented in the living room of the house. The next morning, Schapiro opened the official conference during which various women artists gave talks, showed slides of artwork, and discussed the exclusion of women from major museum exhibits and gallery spaces. Womanhouse opened for public exhibition on January 30, Approximately 4,000 visitors viewed the house and attended the evening performances over the course of the installation s exhibit period. 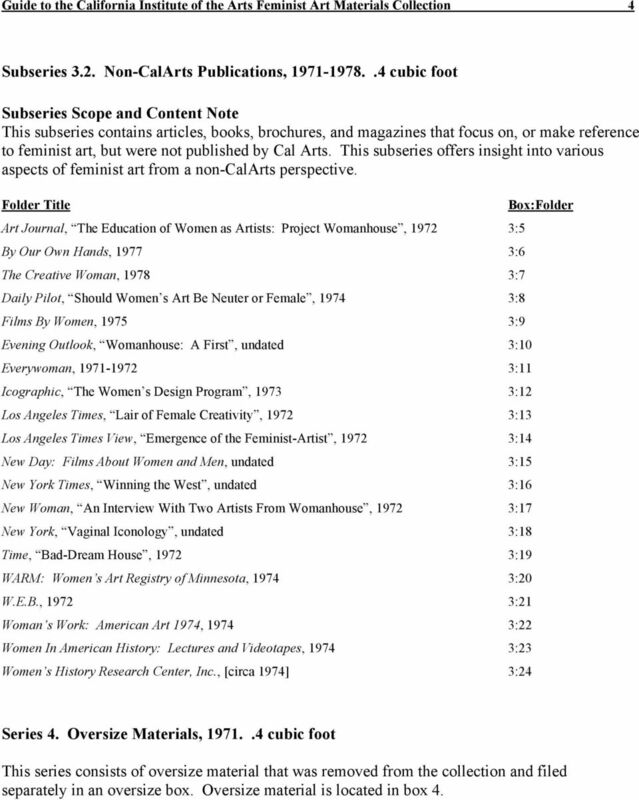 Activities related to feminist art continued to emerge throughout the early 1970s. On June 6, 1972, an exhibit entitled Ablutions, developed and created by Chicago and three students, Suzanne Lacy, Sandra Orgel and Aviva Rahmani, opened for public exhibition off-campus. In 1973, Chicago, de Bretteville, and art historian Arlene Raven founded the Feminist Studio Workshop (FSW), the first independent school for women artists. That same year, the Woman s Building in Los Angeles was also founded. 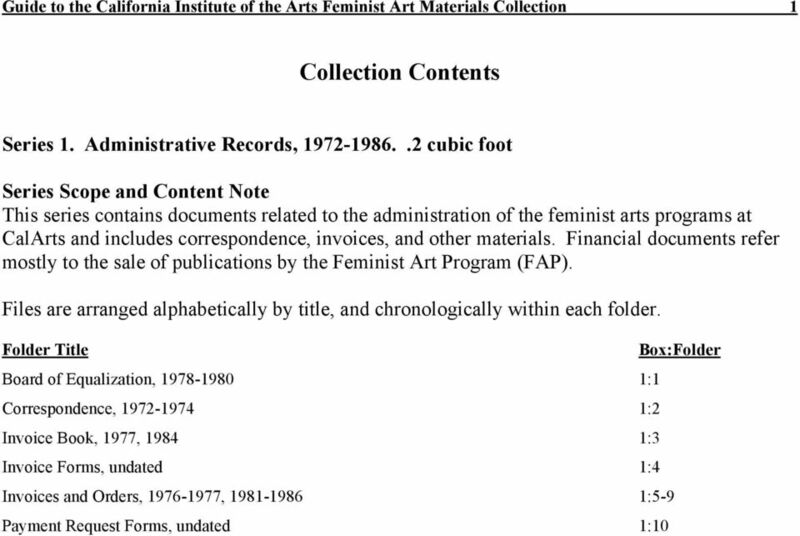 Other events held at CalArts included the Feminist Art Festival which took place from May 27-31, However, despite the positive impact of such activities, the FAP dissolved, mainly as a result of Chicago and Schapiro s departures in 1973 and 1975 respectively. 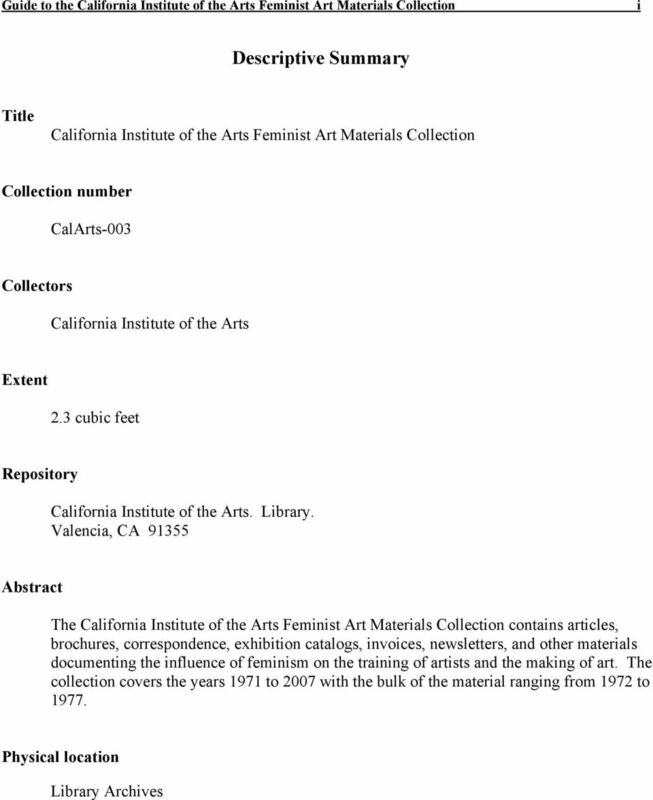 6 iv Although many of the organized feminist art programs at CalArts formally ceased to exist, beliefs and ideas cultivated from the programs of the early 1970s continued to be influential. 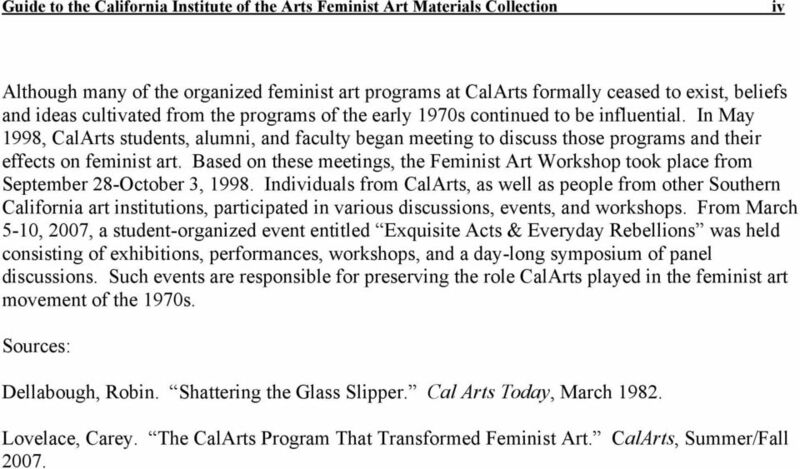 In May 1998, CalArts students, alumni, and faculty began meeting to discuss those programs and their effects on feminist art. Based on these meetings, the Feminist Art Workshop took place from September 28-October 3, Individuals from CalArts, as well as people from other Southern California art institutions, participated in various discussions, events, and workshops. From March 5-10, 2007, a student-organized event entitled Exquisite Acts & Everyday Rebellions was held consisting of exhibitions, performances, workshops, and a day-long symposium of panel discussions. 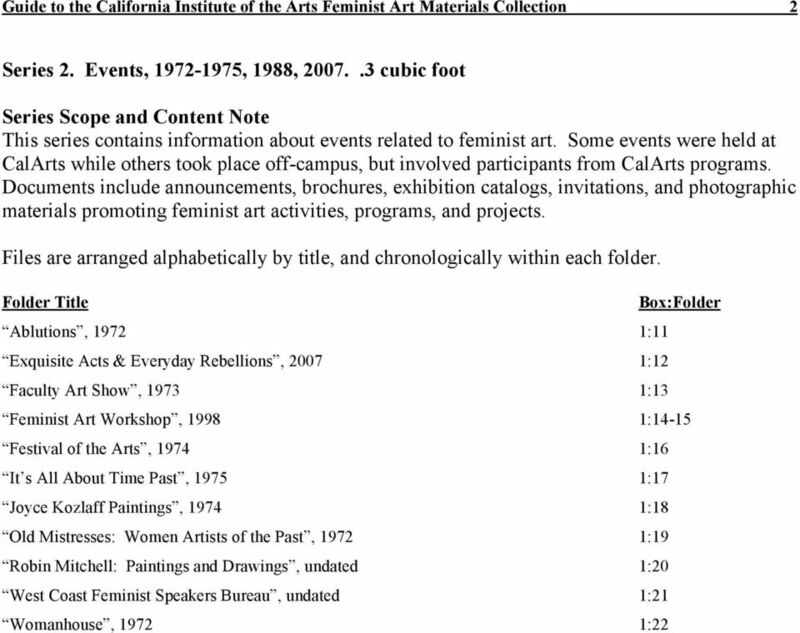 Such events are responsible for preserving the role CalArts played in the feminist art movement of the 1970s. Sources: Dellabough, Robin. Shattering the Glass Slipper. Cal Arts Today, March Lovelace, Carey. The CalArts Program That Transformed Feminist Art. CalArts, Summer/Fall 2007. 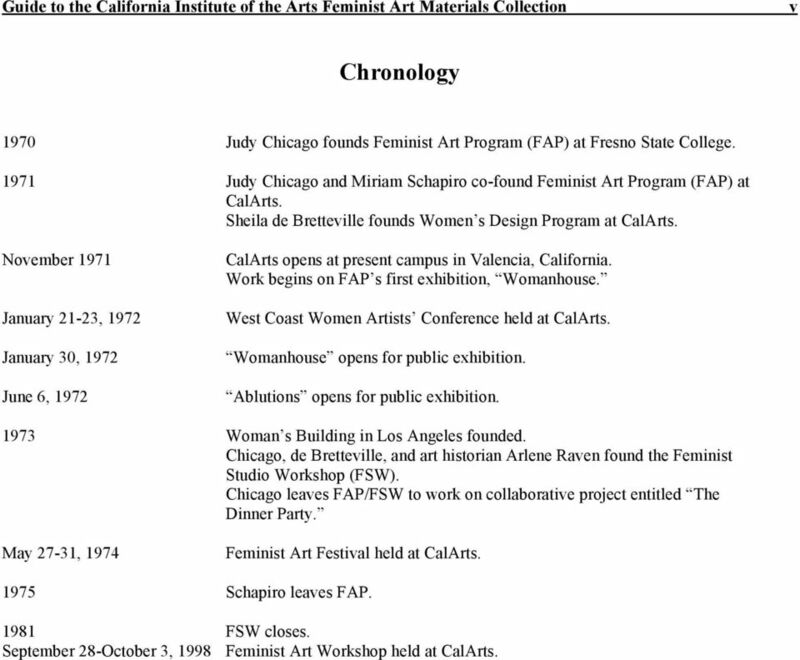 7 v Chronology 1970 Judy Chicago founds Feminist Art Program (FAP) at Fresno State College Judy Chicago and Miriam Schapiro co-found Feminist Art Program (FAP) at CalArts. Sheila de Bretteville founds Women s Design Program at CalArts. November 1971 January 21-23, 1972 January 30, 1972 June 6, 1972 CalArts opens at present campus in Valencia, California. Work begins on FAP s first exhibition, Womanhouse. West Coast Women Artists Conference held at CalArts. Womanhouse opens for public exhibition. Ablutions opens for public exhibition Woman s Building in Los Angeles founded. Chicago, de Bretteville, and art historian Arlene Raven found the Feminist Studio Workshop (FSW). Chicago leaves FAP/FSW to work on collaborative project entitled The Dinner Party. 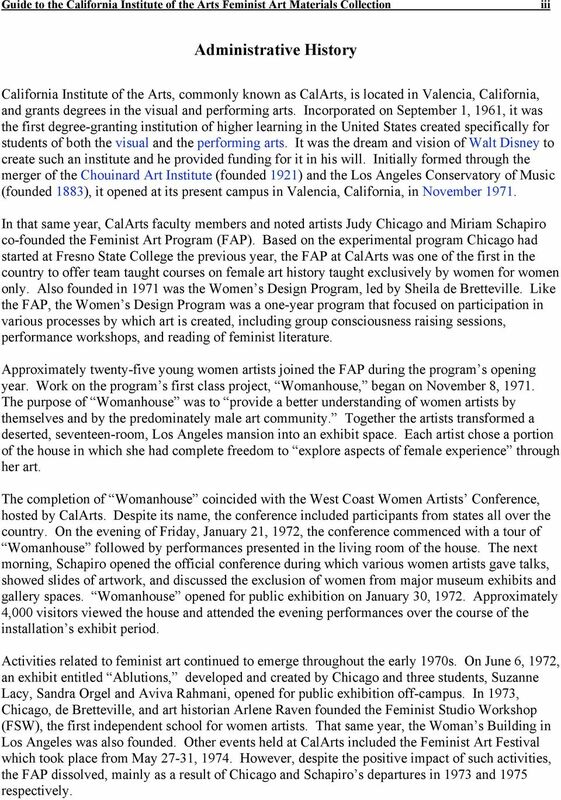 May 27-31, 1974 Feminist Art Festival held at CalArts Schapiro leaves FAP FSW closes. September 28-October 3, 1998 Feminist Art Workshop held at CalArts. 9 vii Indexing Terms The following terms have been used to index the description of this collection in the library's online public access catalog. Subjects California Institute of the Arts. Chicago, Judy, de Bretteville, Sheila. Feminism and art. Raven, Arlen, Schapiro, Miriam, Genres and Forms of Materials Articles. Black-and-white photographs. Brochures. Correspondence. Exhibition catalogs. Invitations. Invoices. Magazines (Periodicals). Newsletters. 13 4 Subseries 3.2. 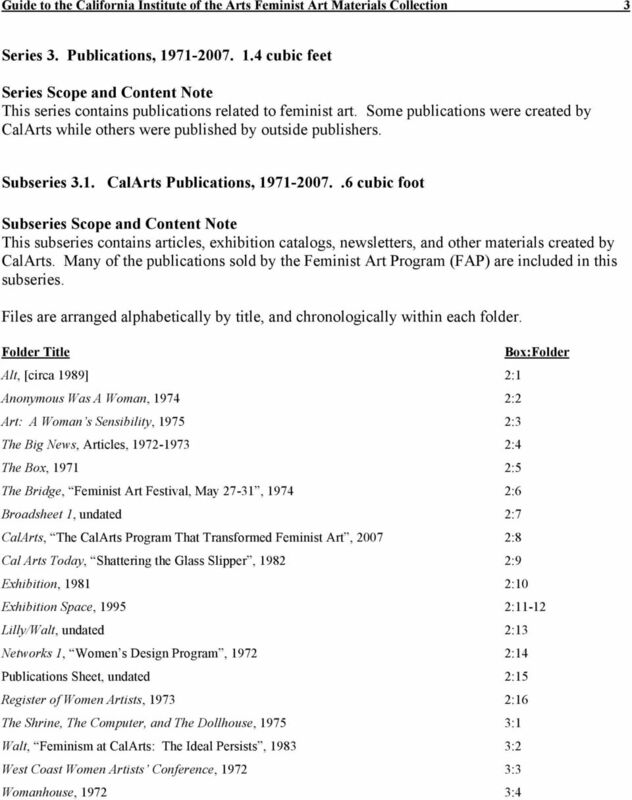 Non-CalArts Publications, cubic foot Subseries Scope and Content Note This subseries contains articles, books, brochures, and magazines that focus on, or make reference to feminist art, but were not published by Cal Arts. This subseries offers insight into various aspects of feminist art from a non-calarts perspective. Folder Title Art Journal, The Education of Women as Artists: Project Womanhouse, :5 By Our Own Hands, :6 The Creative Woman, :7 Daily Pilot, Should Women s Art Be Neuter or Female, :8 Films By Women, :9 Evening Outlook, Womanhouse: A First, undated 3:10 Everywoman, :11 Icographic, The Women s Design Program, :12 Los Angeles Times, Lair of Female Creativity, :13 Los Angeles Times View, Emergence of the Feminist-Artist, :14 New Day: Films About Women and Men, undated 3:15 New York Times, Winning the West, undated 3:16 New Woman, An Interview With Two Artists From Womanhouse, :17 New York, Vaginal Iconology, undated 3:18 Time, Bad-Dream House, :19 WARM: Women s Art Registry of Minnesota, :20 W.E.B., :21 Woman s Work: American Art 1974, :22 Women In American History: Lectures and Videotapes, :23 Women s History Research Center, Inc., [circa 1974] 3:24 Box:Folder Series 4. Oversize Materials, cubic foot This series consists of oversize material that was removed from the collection and filed separately in an oversize box. Oversize material is located in box 4. Q: How do I apply to Cal Poly Pomona? A: See http://dsa.csupomona.edu/admissions/ for all admission information to the University. Q: Can I transfer to Cal Poly Pomona from another college or University?